We’d love your help. Let us know what’s wrong with this preview of Predator by Bryan Thomas Schmidt. An anthology celebrating the 30th anniversary of the PREDATOR franchise, IF IT BLEEDS includes seventeen brand new, never before seen stories--exclusive to this collection--featuring the Predators throughout space and time. 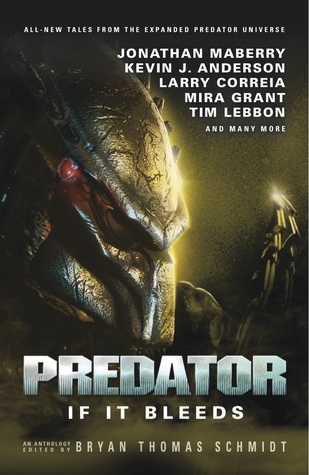 Based entirely on the original films, novels, and comics, PREDATOR: IF IT BLEEDS (a quote from the original movie) reveals the Predators stalking prey An anthology celebrating the 30th anniversary of the PREDATOR franchise, IF IT BLEEDS includes seventeen brand new, never before seen stories--exclusive to this collection--featuring the Predators throughout space and time. 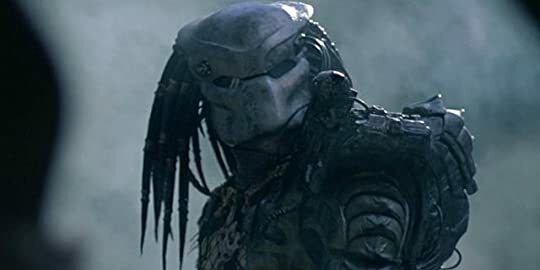 Based entirely on the original films, novels, and comics, PREDATOR: IF IT BLEEDS (a quote from the original movie) reveals the Predators stalking prey in 12th Century Japan, 9th Century Viking Norway, World War I, Vietnam, the Civil War, Hurricane Katrina, and the modern day, as well as across the far reaches of future space. To ask other readers questions about Predator, please sign up. 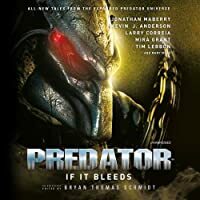 The promise inherent in a “Predator” anthology would seem to be sky high…so why did “If It Bleeds,” which is comprised of 16 short stories by the likes of such greats as Tim Lebbon, Steve Perry, Kevin J. Anderson, Mira Grant, John Shirley, and Jonathan Mabberry, among others, ultimately leave me feeling so…meh? I suspect it has something to do with the fact that, for all of the variety in settings that the stories may have – including stories set in the far-flung future, 9th century Norway, Viet The promise inherent in a “Predator” anthology would seem to be sky high…so why did “If It Bleeds,” which is comprised of 16 short stories by the likes of such greats as Tim Lebbon, Steve Perry, Kevin J. Anderson, Mira Grant, John Shirley, and Jonathan Mabberry, among others, ultimately leave me feeling so…meh? Predator is one of my favorite movies so I had to read this the second it came out! I was not disappointed, this was a consistently good time. 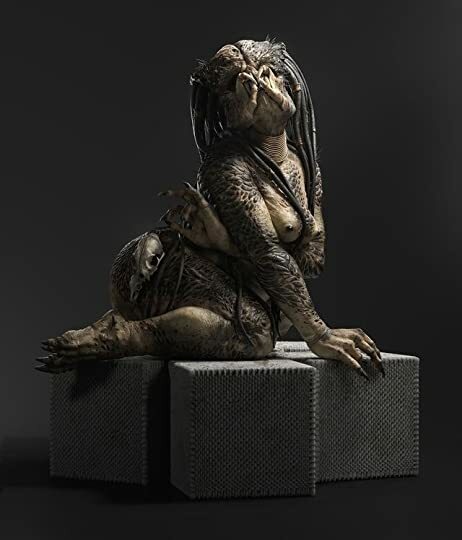 There was even a story with a female Predator! Oddly, I’d never thought about this... but, uh, it seems other have. A lot. Hurricane Katrina vs Predator vs Megawolf vs Military - the writing was everywhere. Too much for a short story, even with the cute ending. Retired LAPD + flaming Brazilian gay guy spouting butchered action movie one-liners vs Predator. Oh man did this stink. This is OUTSTANDING. I have all the Predator books and I have enjoyed them very much. This one however, is just wonderful. The Predators are tough, vicious yet honorable. The stories are placed throughout history and are fast paced and great. Usually collections of short stories have a few "dogs" in them .... this book is FULL of good reads. I highly recommend it. I think after I read this I want to be a "Predator" when I grow up and join them on the hunt. What is it about? A squad off colonial marines are tasked with a retrieval mission on a remote research station. Thoughts: This one read very much like an aliens story. Right up to the appearance of the Yaujta. Actually, even then, the feeling remained. Mixed in with the violence and action is quite a hard look on the liberties humanity feels like it can take. What is it about? A squad off colonial marines are tasked with a retrieval mission on a remote research station. Thoughts:	This one read very much like an aliens story. Right up to the appearance of the Yaujta. Actually, even then, the feeling remained. Mixed in with the violence and action is quite a hard look on the liberties humanity feels like it can take. What is it about? A scouting mission during the American Civil War encounters a Devil in the woods. Thoughts:	This was an enjoyable reworking of the original film as if it were based in 1863 and with some of the hunting gear from Predator 2. It certainly felt as if it were inspired by the pistol given as a trophy at the end of Predator 2. A solid Predator story. What is it about? A Yaujta and her mate hunt down an ooman who had not only survived a previous encounter, but had also killed the hunter. Thoughts:	This is told in from two main perspectives, the humans’ and the predators’ and this does add a nice element with the predators’ interactions with one another. It’s interesting that Steve Perry has changed the lore he set down in his Aliens vs. Predator: Prey novel where the females dominate over the males and see the hunting is beneath them by having a female involved in this hunt. It’s well paced with a hand bunch of useless oomans for the predators to butcher (literally as a stretching warm up exercise). The tension was well strung and the survival of any of the oomans we cared about was never certain, but then neither was it for the predators either. What is it about? The story follows a band of Buffalo Soldiers based in Central Mexico during the 1916 Punitive Expedition. After an altercation with the native Comanches, four soldiers find themselves in a duelling match against four Ya-OOT-ja to the death. Thoughts:	Despite being based in a battle I’ve never heard of, I found myself quickly invested in this story. The link of the predators to the native Comanche’s was, perhaps, a little tenuous but still believable enough to make sense. The duel itself was refreshing in that I’d not seen predators in a straight-up one-on-one fair(ish) fight. (Unless you count the yakuza in the film Predators.) I also greatly appreciated the handy phonetic spelling of Yautja (I’ve always read it as Yowtcha). What is it about? Based in New Orleans during the height of Storm Catrina, a rescue team save an unconscious boy with some disturbing footage on his camera. Thoughts:	Even though there was no heist this had a resonant feeling of the film Hard Rain starring Christian Slater and Morgan Freeman. This story is a little bit different in that it’s not a Yaujta hunting the people. There’s something else, and the Yautja is hunting that. I can’t say more than that plot-wise, but I can say that the story was very enjoyable, and the creature is an interesting one. It started off using the found footage trope, but thankfully passed that and got on with telling the story properly. Exciting stuff. What is it about? A salvage crew board a derelict scavenger ship, but they’re not alone on board. Thoughts:	This one probably was less impactful as it features in a compilation of Predator stories so you know exactly what’s in store for our hapless space crew. Indeed, this story does play out as expected and this could have had any alien nasty as the ‘monster’ in this one. I still found the action exciting and appreciated the uncertainty as to who, if anyone, would survive. What is it about? In 820 AD a retired predator leads three newly blooded youngsters on a hunt for Viking oomans. Thoughts:	The story is told from two perspectives, the Vikings’ and the predators’. The Vikings are attempting to take the titular keep that has been ravaged by a mysterious disease. The action is understandably graphic and visceral with lots of bladed weapons encountering those fragile human bodies. The battle did have a certain A Song Of Ice And Fire feel to it. My only issue was that there was no real explanation as to what the illness was. What is it about? A colony on the brink of survival finds itself in the middle of a hunt between the planet’s top predator and the Yautja. What is it about? Two orphans who live with their abusive aunt and uncle find a change in fortune when a mysterious star lands nearby. Thoughts:	This was a satisfying tale that suggest that the Yautja are more aware of humanity’s shortcomings than we would have thought. What is it about? A soldier who has stood up against a superior officer finds himself testing a reverse-engineered suit of Yaujta armour, against a captive Yaujta. Thoughts:	Anther interesting concept that doesn’t quite go in the expected directions. I found myself rooting for the Yaujta as much as I did the soldier. What is it about? A rogue samurai is given the task of hunting down the Oni of Aokigahara, a forest demon that kills and skins it’s human victims. Thoughts:	A very compelling tale that feels like a retelling of Predator but with a forest instead of a jungle and samurai with swords instead of soldiers with guns. And no chopper, obviously. This was very enjoyable and highly satisfying. What is it about? When a downed American pilot captured by the Russians attempts to escape his captors, he discovers that his fellow prisoner hails from a little further than China as he initially believed. Thoughts:	Easily the best story in this collection so far. The character’s plight was believable and felt authentic from the start. His escape was thrilling and when he joins forces with the otherworldly captive the action is exciting and so well realised through his eyes. I enjoyed this one immensely. What is it about? It’s the wild west and the local sheriff of a small town is approached by a gang from his past. Thoughts:	What happens when a standard Western story is suddenly hijacked by an alien influence. Well, apart from Coyboys and Aliens, this. The story develops naturally as a standard Western with the sheriff standing up to a gang, and then embarking on rescuing a child from a kidnap situation. Then blood starts happening. I enjoyed the unique method used to get the better of the Yautja and again there was an nice insight into how the predators view humanity. What is it about? Twenty years after Predator 2 Harrigan and Garber find themselves facing a familiar threat. Thoughts:	I do appreciate it when a story can tie into established cannon. I like Predator 2 a lot and I thought it great that we had a return of Harrigan. Just like the film, this features a lot of explosive urban combat making this exciting and adrenalin-filled. The final twist was a delight. What is it about? A recon squad deep in the Vietnam jungle find that they’re up against not just the Vietnamese. Thoughts:	Another story heavily influenced by Predator. The characters were a little lacking in their characterisation and the story didn’t really play out much differently to how it does in Predator. It was enjoyable enough and still manages to stand out from the other stories in this collection. What is it about? Set in the future on a privately-owned world where an illegal fight arena pits combatants against enhanced dangerous animals. All goes well until a Yautja is made to fight. Thoughts:	This one had quite a bit of build-up, which again was undermined by featuring in a book with a Yautja on the front cover. However, even knowing that the lead character was going to be duelling against a Yautja, the action was still exciting with a Sherlock Holmes level of detail in the combat. The twist in this was very enjoyable, if a little anticipated. I was very sceptical about this after the Aliens one (https://www.goodreads.com/review/show...) but this is a very different beast. For a start all the stories were enjoyable and felt like the authors had at least seen the films (if not the EU material and comics) which made things a lot nicer. The predators felt like they should, menacing yet honourable and interested in the hunt above all, the human characters usually had a good role to play and it all worked together nicely. There's some nice A I was very sceptical about this after the Aliens one (https://www.goodreads.com/review/show...) but this is a very different beast. There's some nice AvP world stories (no actual aliens though) some historical predator encounters which are fun and some modern day and random futuristic encounters too. Towards the end of 2017/at the start of 2018 I picked up both this and Aliens: Bug Hunt, as I'd always had a soft spot for both those films. Both as sci-fi anthologies; both are based around their respective properties. I read the latter first, and (truth be told) wasn't overly impressed: while there were some good stories amongst those included, none really stood out all that much. As a result, I put off reading this until I worked my way through some 'proper' novels, and only came back to this r Towards the end of 2017/at the start of 2018 I picked up both this and Aliens: Bug Hunt, as I'd always had a soft spot for both those films. As a result, I put off reading this until I worked my way through some 'proper' novels, and only came back to this relatively recently. Thankfully, of the two anthologies, I found this to be the better (despite a somewhat ropey start). I think that may be due to the central conceit of the Predators: as (effectively) alien Big Game hunters, that allows these stories to be set at any point throughout human history, not 'tied down' to the future as the Alien stories are. This book is essential for anyone that is a fan of the Predator franchise. There are no disappointments in any of the stories and the action is fast and furious. One of the standouts for me was Larry Correia's entry, set in feudal Japan, that ends with a wonderful revelation. I really like when fiction blends well with fact! Additionally, the final story of the collection by John Mayberry took me back to a story I read as a child. (It was a story about human fighters competing against vastly sup This book is essential for anyone that is a fan of the Predator franchise. There are no disappointments in any of the stories and the action is fast and furious. One of the standouts for me was Larry Correia's entry, set in feudal Japan, that ends with a wonderful revelation. I really like when fiction blends well with fact! Additionally, the final story of the collection by John Mayberry took me back to a story I read as a child. (It was a story about human fighters competing against vastly superior alien ones). While the story was not a duplication, rather an unintentional homage, it was nice to take a trip down memory lane as a result. Fantastic anthology in the same vein as the Alien anthology from earlier in 2017. I enjoyed the stories and different perspectives that range from Earth's past to humanity's future. Some of these stories would be a great basis for a new Predator film. I can't really say there was any story that I completely didn't care for. There was one story where the action seemed to blend together because of confusing writing but other than that this was a fantastic read. I hope they do another one in the fu Fantastic anthology in the same vein as the Alien anthology from earlier in 2017. I enjoyed the stories and different perspectives that range from Earth's past to humanity's future. Some of these stories would be a great basis for a new Predator film. I love all things Aliens and Predator. I love the combination of the two and I must say that this was a wonderful Predator only book. This book has a series of short stories about humans versus Predators and I was happy to see at least one story in which the Predator won. The interesting stories for me were the ones in which humans and Predators worked together! Read, enjoy and have fun. Do not look for deep, thought provoking ideas when reading this series. Out of all the stories in this anthology I only skipped three after reading the first few pages. That’s high marks. In most anthologies I find I only like half of the stories. The other 13 stories that I read in full I’d say 10 of them left me wanting more. I will also be looking to read more from several of the authors. If you count yourself a fan of the films or some of the past books or comics give this a try. A collection of short stories based on the Predator franchise, both film and written. The stories were OK, with one being really enjoyable. A couple were fairly lame and the rest were acceptable. Some of the narrators were poor, but thankfully most lasted under an hour. That's me caught up on the books now. Excellent collection of stories about the dreaded Yautja or Predators, who hunt humans (and other creatures) for sport. Some of the more interesting stories in this collection have the Predators hunting on earth in earlier periods of history - the Predators vs. Vikings story is particularly good, if gruesome, ending with multiple casualties on both sides! I read this to help myself forget the awful new movie and it didn't let me down. A great collection of short stories featuring the Predator. All of them are better than the new film and I would easily have found several of the stories good adaptations to film. My favourites being the rogue Samurai vs predator and the Vikings vs predator. As a longtime fan of the predator franchise, this anthology was chuck full of awesomeness! There are some amazing short stories here that lovers of the dreadlocked monster will enjoy! Loved the fact that within a few pages of each story beginning there were Predators, no build up, no character build, little to no back ground story, just action and killing. Some where good, some where great, none where bad. Hello, I really wanted to like this book a lot. But, come on folks, are we going to put the greatest hunter killer on Zoloft. I say "Hell No" to that. Bring back the killing machine from the first movie. Thanks. For some dedicated hunters, at times the Predators seemed to rely a lot on shooting their cannon or other gizmos, kinda like killing sprees before reloading the last save on a videogame. I appreciated the Predator's P.O.V. parts. This book was great! I enjoyed every story in it. My favorites were Stonewall's Last Stand, Blood and Sand, Three Sparks and Gameworld. I would love to see more Alien and Predator anthologies! If you love predator, you'll love these stories. Loved it, some interesting stories from both perspectives. If you are a fan of the franchise you must read it. A Fun read, some stories were better than others. Kind of a mixed bag, as many compilations are. There are only a couple really good stories, but they are worth the purchase of this book. If you liked the Predator movies -- and especially if you liked "Aliens: Bug Hunt" -- you'll enjoy this book. It may not win any Pulitzers, but it's a great way to spend several hours. Bryan Thomas Schmidt is an author and Hugo nominated editor of adult and children’s speculative fiction. His debut novel, The Worker Prince received Honorable Mention on Barnes & Noble Book Club’s Year’s Best Science Fiction Releases for 2011. His first children’s books, 102 More Hilarious Dinosaur Books For Kids and Abraham Lincoln: Dinosaur Hunter- Land Of Legends appeared from Delabarre Pu Bryan Thomas Schmidt is an author and Hugo nominated editor of adult and children’s speculative fiction. His debut novel, The Worker Prince received Honorable Mention on Barnes & Noble Book Club’s Year’s Best Science Fiction Releases for 2011. His first children’s books, 102 More Hilarious Dinosaur Books For Kids and Abraham Lincoln: Dinosaur Hunter- Land Of Legends appeared from Delabarre Publishing in 2012. His short stories have appeared in Tales of The Talisman, Straight Outta Tombstone, The X-Files: Secret Agendas, Predator: If It Bleeds, Decision Points and many more. He edited the anthologies Space Battles: Full Throttle Space Tales #6 for Flying Pen Press, Beyond The Sun for Fairwood Press, Raygun Chronicles: Space Opera For a New Age for Every Day, Shattered Shields with coeditor Jennifer Brozek (Baen, 2014), Mission: Tomorrow (Baen, 2015), Galactic Games (Baen, 2016), Decision Points (WordFire, 2016), Little Green Men--Attack! with Robin Wayne Bailey (Baen, 2017), Monster Hunter Files with Larry Correia (Baen, 2017), Joe Ledger: Unstoppable with Jonathan Maberry (St. Martin's Griffin, 2017), Predator: If It Bleeds and Infinite Stars both for Titan Books, 2017. As editor, he has edited books for Grail Quest Books, Wordfire Press, Delabarre Publishing and authors including Andy Weir's The Martian which hit number 6 on the New York Times Bestsellers list in 2014, Angie Fox, Leon C. Metz , Ellen C. Maze, David Mark Brown, and more.